A collection of aviation photos of airliners, private jets, vintage airplanes, helicopters, small props and RC airplanes. You also find useful information about plane spotting locations of several airports. Images are clustered in different categories: Planes with special color schemes, alliance color schemes, retro color schemes and also a section of the best shots. Via links to the aviation photo databases airliners.net and jetphotos.net you can view most of the photos in higher resolutions of up to 1600x1080 pixels. Spotting locations of Los Angeles Intl. 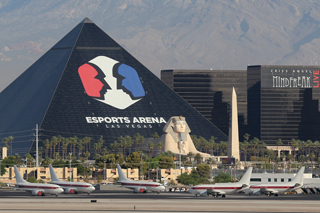 Airport and Las Vegas McCarran Intl. Airport have been added to the "Spotting Locations" section. On May 26th Iron Maiden came with their "Ed Force One" to Düsseldorf to perform at the rock festival "Rock im Revier". Images can be found in the photo gallery. 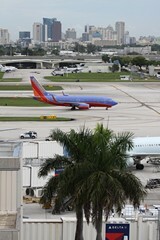 Spotting locations of Miami Intl. Airport and Fort Lauderdale Intl. Airport have been added to the "Spotting Locations" section. Airbus send over it's fifth A350-900 prototype (reg. 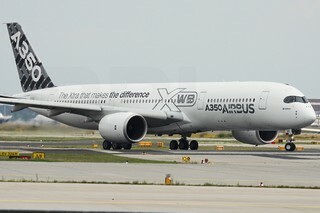 F-WWYB) to Frankfurt for one of it's "Route-Proving" tests. The plane arrived at FRA on 25JUL2014 around 18:45LT an left the next day at 14:15LT. Three photos of this occasion can be found in the photo gallery. All photos in the gallery section "Spotting Locations" have been enhanced with latitute/longitute data. Whenever a location photo is displayed, a little red icon in the upper left corner (above the EXIF data) can be clicked to open the location information in Google Maps. How to get to the spots? 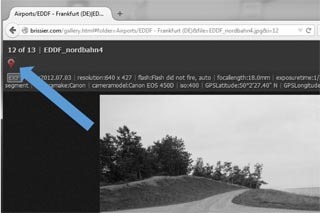 All photos in the gallery section "Spotting Locations" contain latitute/longitute data. Whenever a location photo is displayed, the icon in the upper left corner (above the EXIF data) can be clicked to open the location information in Google Maps.